This article discusses the recent appearance by Dr. Patrick Defazio D.C. on the Dr. Phil show to discuss Chiropractic's role in Healthcare.A link to the full article appears at the bottom of this post. On the morning of Feb. 23, 2012, history was made when Dr. Fabrizio Mancini, a doctor of chiropractic and the president of Parker University in Dallas, Texas, and Dr. Patrick DeFazio, a Los Angeles doctor of chiropractic, were filmed for an upcoming episode of the "Dr. Phil" show at Paramount Studios in Hollywood, Calif. This was chiropractic's first appearance on the popular daytime talk show, which is broadcast on 220 television stations across the U.S. and in more than 40 countries worldwide. Nearly 21 million viewers tune in weekly to hear the advice given by Dr. Phil McGraw, a clinical psychologist with 25 years in practice, and the show's online presence is over 2 million unique viewers/followers per day. 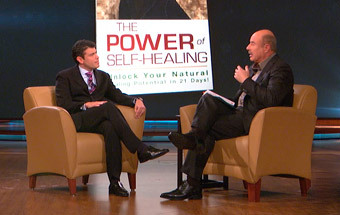 The segment, which airs this Wednesday, March 14, began with Dr. Phil introducing Dr. Mancini as his chiropractor for 14 years and author of the book The Power of Self-Healing: Unlock Your Natural Healing Potential in 21 Days! This introduction set the stage for Dr. Mancini to talk about his book and the concepts of chiropractic. He stated that "the only way to truly fulfill your life potential is to fulfill your health potential." Dr. Mancini added that the difference between chiropractic and what he called the "sick care system" in the U.S. is that "we see patients as [people, not just diseases]." Dr. Phil reinforced this notion, telling viewers, "I got chiropractic treatment from you [Dr. Mancini] 2 or 3 times a week." He went on to introduce his current personal chiropractor, Dr. DeFazio, who was given an opportunity to talk more about chiropractic and how it can, among other benefits, help relieve stresses on the body.